If you have concerns about being able to afford retirement, you are not alone. For many Americans, the prospect of a comfortable retirement remains an elusive goal. 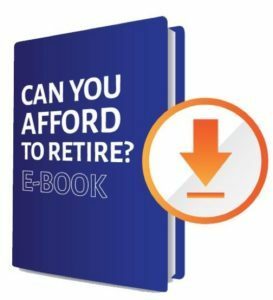 As you continue to prepare and educate yourself with retirement saving strategies, we hope you find our Can You Afford to Retire? handbook a helpful tool. No two financial plans are alike, but they all begin with the same steps. Step 1: Determine your goals & write them down. Take the time to discuss them with your spouse and/or loved ones. Step 2: Analyze your current situation by listing all your assets, liabilities and miscellaneous expenses. You will spend at least the same in retirement. Step 3: Design a plan tailored toward your lifestyle. Revisit your goals and begin to create a strategy. Step 4: Implement the plan. Now that the plan is outlined, do you have the time and knowledge to proceed into the execution phase? Step 5: Monitor and Adjusting the plan. We all know that life is unpredictable. How will life’s events impact your plan and when is the appropriate time to adjust? Step 6: Continue to educate yourself. You worked hard to create a legacy, and you owe it to yourself and your loved ones to protect it.